How 'bout these ruby slippers (and matching necklace**)?! I've always felt a little sorry for female birds, they don't have the splashy colors and plumage the males do, so I dressed this girl up for a wild night out! (Just make a bunch of dots with your red marker for the necklace and dot with Stickles)The inside says "time to kick up your heels!" or projects with the image you aren't quite feeling yet since you have no clue what to do with and need some great ideas?? BTW, help me NAME THIS BIRD! I noticed the other day that Faith(who's giving away some blog candy!) had named my ostrich Oscar! I like it! But now we also need some fabulous name for its tail feather-shaking female counterpart, any suggestions? The first thing that comes to my mind is Fanny... (or Dolores, I don't know why!) I'm going blank on "O" names...........Olivia? Odette? what do YOU think?? *or, "I could have daaaaaanced all niiiiight, I could have daaaaanced all niiiiiight..."
or, "I wanna PUT on, mymymymymy boogie shoooooes, and BE with you..."
I've been meaning to try one of these kick stand cards for awhile, but what I started out making never really worked as far as the layout, they always looked too bottom-heavy to me, just not quite the right design so I would always end up making a regular card. But here I had an idea to use a shape other than a square or rectangle for the kickstand, and turning it on it's side to match the DCVW DP so that the front just rests on one point, perfectly balanced, ta da! Isn't that fun? The stars are mounted on dimensionals and the "Jumping for Joy" seal has his horn from the same set, and is further accessorized with the party hat from "Hip Hop Accesssories". Here's a close-up to see the inside of the card better when it's closed. The dotted lines are from SU! 's All in a Row set. I stamped the seal in Basic Brown and colored him with the E13 Light Suntan Copic (my favorite color I've used for the seal so far, really shows the detail so much more with this lighter brown) , outlined with Pale Aqua. I also added the little "whoosh" on the DP above to make the star look like it was falling, to go with the "zoooom" and the little airplanes on the DP. I made the star frame with a this star piercing template from Gina K, which she is going to be selling in her online store, wait til you see! First I pierced my white star. I counted 7 over each time to make sure I wasn't going too long on any side. Then I carefully trimmed around the dots. Next I wanted a red mat, so I placed my cut white star on top, chose the track outside that and pierced a hole at the end of each point, and 2 holes where the points join together. (Hopefully you can see when you click on it. You can't just make one hole because of the way the plastic meets up.) 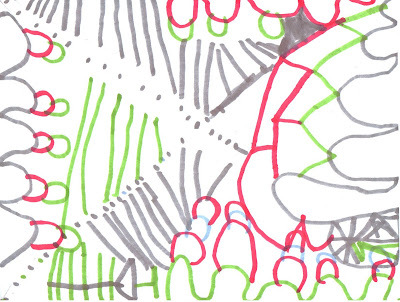 Then just connect the dots with your scissors cutting just past the inside whole and then go the other way , cutting just past to meet you first cut. A perfect mat! *or "Catch a Falling Star!" I considered putting the family snapshot inside the card so I wouldn't cover up the cute folding, but really wanted it to be on the outside. I also considered having the snapshot hanging off the edge but didn't want to mess with having to make a custom envelope to fit it**! Then I thought about making a huge card out of one folded sheet of 8 1/2 x 11 since I have big envelopes, but I just wasn't liking how much space that left around my shirt and image, even when adding other layers and such. Finally, I decided to just overlap the tie a bit with my stamped image, popped up on dimensionals. That looked pretty good, but it need something else in the corner, besides just the greeting. I decided to make a little sleeve folded over from the extra piece I had from cutting my shirt, and folded up the cuff. (I like how the white edge there echoes the collar and points toward "Dad"). I attached it with dimensionals. Inside I stamped "Thanks for always taking care of us! Happy Father's Day! ", also from the Kindred Greetings for Him. 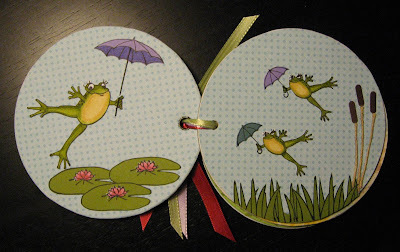 I stamped them in an arcing pattern, making sure to turn the second safety pin so it looks like they're flipping around, and stamped the little "whoosh" near each flipper to put all the objects in motion. Everything is outlined with the clear glitter Spica. Thanks everybody who answered my poll, the zebra took 50% of the vote(but only a handful of my readers voted) Which just leads me to more questions, I'm posting a new one tonight, come back to check it out! Don't forget to enter Lee's candy, see post below! Oh my goodness, look at this CANDY! You've got to go check out what Lee made with the "Jumping for Joy" set, my first "Joy-sighting" (other than theDT members!) Bet you didn't think anyone was gonna make that carousel, did you?? What a GREAT idea! ...with a kicked-up surprise inside! 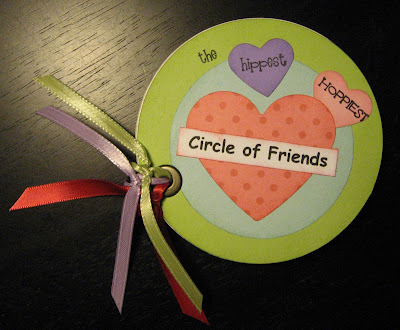 To get the right arc for your greeting, lay your acrylic block on top of your scallop. I trimmed my greeting up a little bit to make the curve( to get an even gentler arc, cut each word individually (but don't lose them!)) Then I placed my scallop on the popped out part (see directions to make the pop up below) so I could see how high I would need to stamp my greeting when standing open, I wanted it to be hovering just above. Then press the card back so you can stamp it, the greeting will look higher on the card(with more space in between) when it's open all the way. To make your layered focal point pop up, after scoring your middle fold, place you CS back in your cutter and make two parallel cuts across the fold in the middle. When you fold the score, push these two cuts out so you have what looks like a little box. Adhere your pop up to the front. (Make sure your focal point is not so big that it sticks out when you close it). If you look back, to the finished inside, you'll see I added some scallops to the top and bottom of the pink layer(in the pic above I just have it resting inside) To make the scallops, take the corner guide off your large corner rounder and punch across the edge. I added a little dot to each scallop with my marker to match my stamped and punched scallop on the front. Front of card uses SU! Hostesss Designer Prints Pack, Chocolate Satin ribbon and SAB So Many Scallops, which I colored DTS with my matching SU! markers. I punched out a scallop in Chocolate Chip as well and offset it below the stamped punch to give it some "pop". 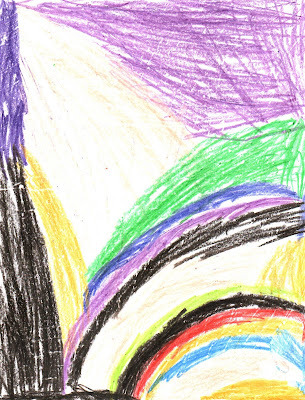 If you have children in your life, you're probably almost as proud of their artwork as you are their photographs! Sometimes I photograph or scan Jonathan's artwork*, to email out to family, but I can't part with the originals. (I am also having difficulty storing all the paper and artwork he comes home with, he doesn't want to throw anything away (even all the practice letter sheets, etc) definitely gets that packrat tendency from his dad and I! I've been meaning to make this for a few months now, but I finally got around to it this weekend: Create a portable keepsake of your child's "most braggable" creations in miniature by scanning, reducing, and printing out their paintings and drawings, then cutting them down to size, and stowing them in a decorated tin. (This size is much more manageable) :) Makes a great gift to send to the relatives, and send more scaled down "originals" over time as they are made and on holidays to add to their collection! 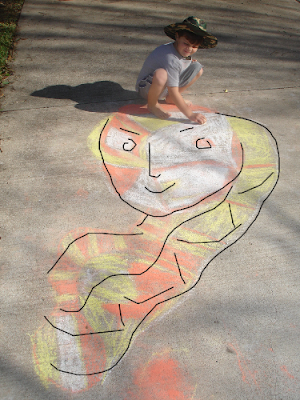 Sidewalk artist: he did this by himself, at age 4(almost 5) Part way through I asked him what he was making, he said, "a girl' s face, with a long braid..."
Okay, remember this wallet? Here's a way to add to that wallet (or construct a similar one different style/dimensions) and make a really cool accordion photo insert, what you'd expect to find in the bill fold of a "proud Papa". Then I went back and used my rectangle like a stencil, sponging ink for the sky and ground around the edges, so then when I took it away, each photo was framed up with the white picture border you see around wallet pics. I went back later and made everything darker, this was just to show me where the borders of each would be for my scoring. Slide and adhere the folded end piece into a pocket you've created in your "wallet". Here you can see the added coloring, done with SU! markers and watercolor crayons. 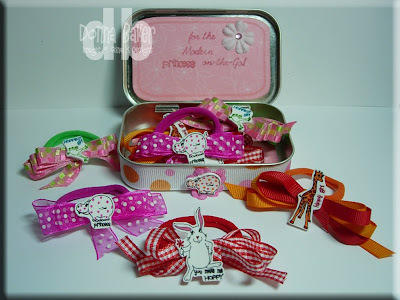 Labels: Gift, Gina K Designs, Kindred Spirits, Nestabilities, Scor-Pal, Tutorial, What's in Your Tin? Honestly, I like to leave the mixology to others LOL! But when I saw Rupa's adorable little blender in "Many Happy Re-turns", I knew it was time to shake things up! Now stamp your blender on a piece of acetate, and adhere to the back of your cut out, just like paper piecing. Now you need to add a row of dimensionals of foam tape all around the blender area to hold your beads. Leave the paper backign on for now so your beads won't stick when you pour them in! Add beads. I used some light and dark green bugles beads (that matched my paper and the new rain dot eyelets I planned to embellish my card) , along with a few little clear microbead "ice chips!" Remove the paper backing on your dimensionals and press another piece of cardstock to fully cover the dimensionals and keep your beads inside. 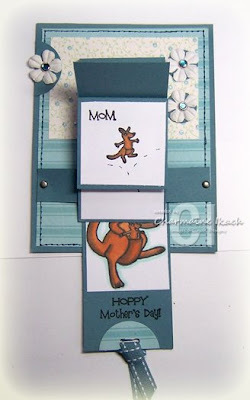 Then attach it to your card. Because I couldn't stop there, I thought it would be fun to accent the corners of my mat and the glitter swirls on my DCVW paper with some of the dots and eyelets, too. (refer to top pic to see how I did the corners on the finished card) As you can see, even though they are called "eyelets", the sheet gives you little "brads", too, and I loved that that you get several sizes and shades of the color on the same sheet, gives you so many options. Now I NEED them in every color! Last I added the ribbon and "little" together tag, and adhered the focal point a little askew, more of a "party vibe", heh heh! I'm working on some new tutorials for you today, look for how to "mix the perfect drink" and a special Kindred Dad father's day card idea on Memorial Day. These are really fun! 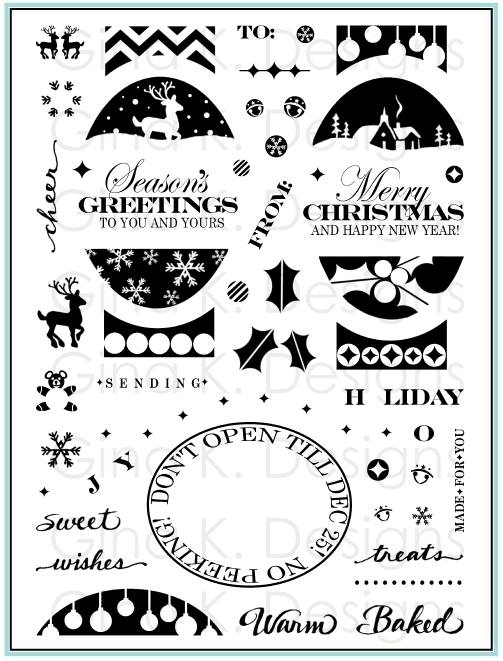 When your stamps arrive, before cutting, ink up the whole sheet of rubber with a waterproof ink and press the rubber down on to the shiny side of the paper backing you peeled off which is what you'll be storing your stamps on. Don't worry about getting a perfect image, it's just a reference to tell you "what stamp where". This month was the first time I realized it is also easy to do this in the Gina K's sets ! Ink up your sheet and carefully press it into the bottom of the tin, it's kind of a tight squeeze, but you can do it! Doesn't that look cool? These are the Kindred Greetings for Him, I'll be using these in Monday's project. If you've already cut them out (with either type of packaging) that's okay, just ink them up individually and arrange them in an order that seems logical to you, or refer to the picture of all the whole image sheet included inside the bag or on the back of your tin. I'm going back when I have a little time and doing this with all my tins(I think I have about 10 now!) it will be well worth it. Here's tent topper with a twist, the arc of the topper is perfect for a spinner track! It was hard to get the tracks photographed but I wanted you to see everything cut before I trimmed out the spinner track piece. You will have two small arcs and one complete circle all the way around. Take your snips and cut out the circle and a straight cut between the parallel tracks on each end. You will need another circle the same size to put behind it if want the track to be less noticeable, like it's really moving through the air. Now add your ball first by placing it on a dimensional(actually for this I used some smaller round ones I have for the size of this track, but you can also trim up the SU! hexagon ones) then a penny, then another dimensional, lay it in the track, and last a penny on the back side. Check the placement of your seal before adhering it to make sure the ball is starting and ending in the same place. Last I added a shadow underneath him with my warm gray 20% Prismacolor marker and my matching Barely Banana mat behind it on more dimensionals so the penny has room to move. Green DCVW textured paper mat behind that. 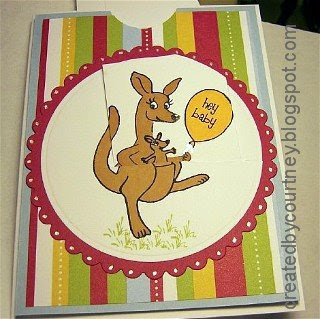 The patterned DP is DCVW mat pack(the different rectangles are embossed, perfect faux frame for your greeting! ), and 5/8 ribbon is SU! It still needed a little something so I added the green brads to match the little circle section on the ball. I gave it to my son last night, he lost his first tooth! After giving it to him(he loved it) he hugged me and said, "Thanks Mom, you've never made me a card before." !!! Yes, I have! After thinking awhile, he said, "You're right, it's just been so long I forgot." :( Note to self: now that Jonathan is old enough not to crumple every piece of paper art I put in his hands, make him cards more often!! All 4 animals are jumping (when you want them to be!) Try them with your greetings from Just So Hoppy! The new ostrich is hippy. Tattoo away! Dress your animals up with the crown and hat from Hip Hop Accessories. The ostrich is really cute running with the kite from that same set. The bear can be seated ("give yourself a hug!") and they can all perch/pose on the stand. The bear and seal(head or feet first!) look terrific diving into the water (little wave stamped again and again). The pedestal stand can also double as a cake (when you add the sparklers),a little tub of water if you add the waves, or a drum. Ink up just the top rim (or cut off the bottom) and you have "hoops" for your animals to twirl, juggle jump through, etc. 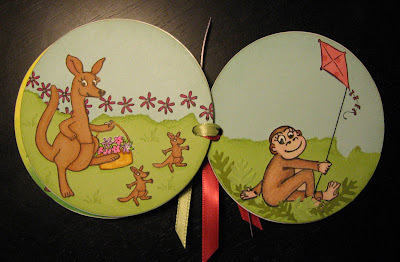 These animals, when colored as "nature intended", lend themselves to neutral color schemes ( enhance and embellish these with the Gina K Zoo brads and any animal print DP) but the addition of the stand and beach ball give you lots of opportunities to add as much color as you want to your creations! 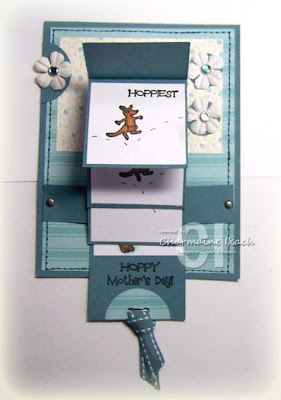 Try choosing colors from your DP or ribbon you'll be using to color in the pedestal's different sections for a perfectly coordinated card. The pedestal looks great paper-pieced. Any of the animals can be blowing the little horn. The stars and confetti make great backgrounds! Also looks terrific to have the ostrich tossing out "wingfuls"of it! Don't forget the glitter! Try adding Fun Flock to give your animals a nice fuzzy texture. Try gluing on tiny feathers onto the ostrick wings and tail. 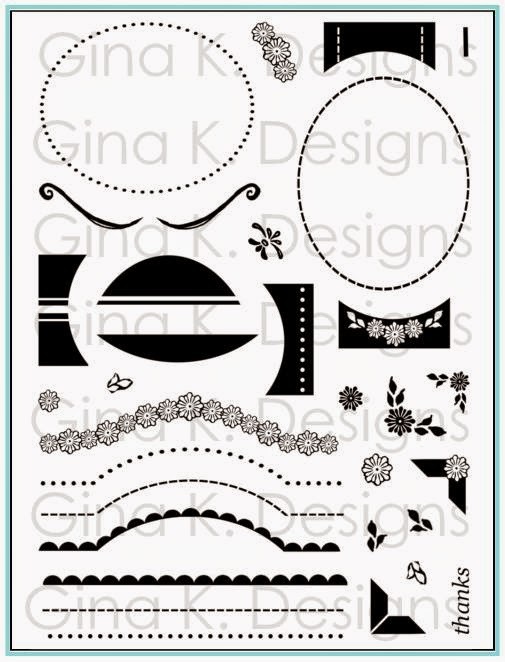 The bold stripes on the zebra allow for fast stamping no need to color to get a nice graphic look! 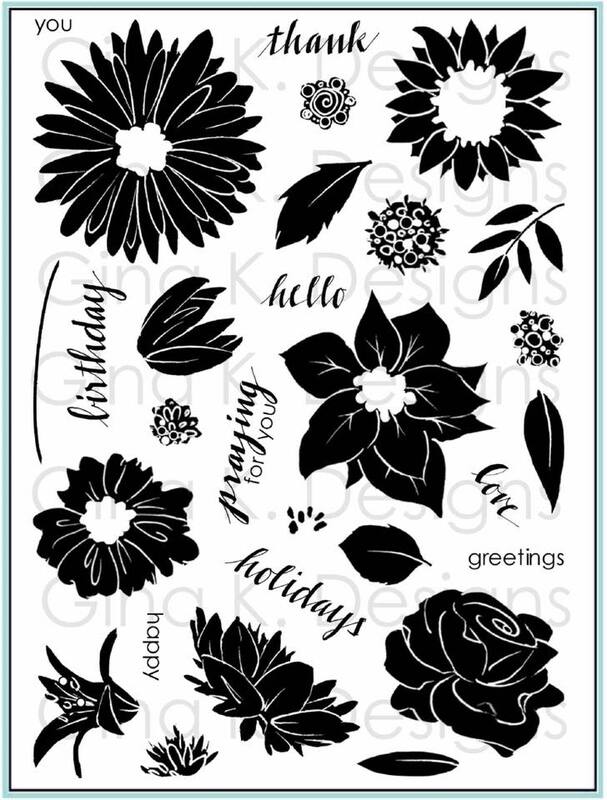 -Change it up by stamping in brown or charcoal or stamping in black and then coloring in the white areas with a pastel or other fun color. 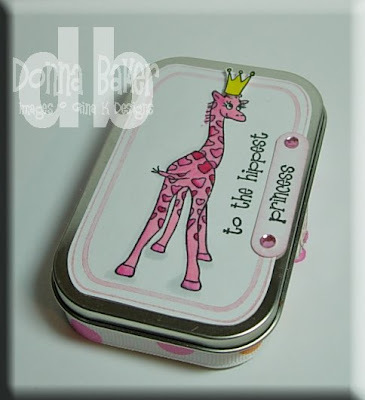 -Try stamping it in a color and then go over the eye and lashes with black or brown to make them stand out. -Bling out your stripes by tracing them with a clear colored Stickles or Spica. 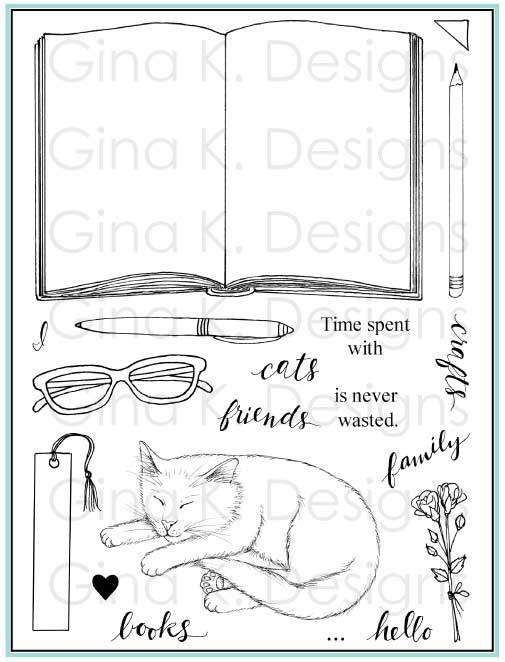 -Ink up just the outline omitting the strips to make a horse, or stamp on colored CS, cut out and flip for a solid, horse, don't forget to add in the mouth and eyes! Distressed Stripes CB folder looks fabulous in green or neutrals to make a grassy plain or jungle, and with the "negative effect" or DTP with your ink pads, this folder is a perfect complement for the zebra's pattern. 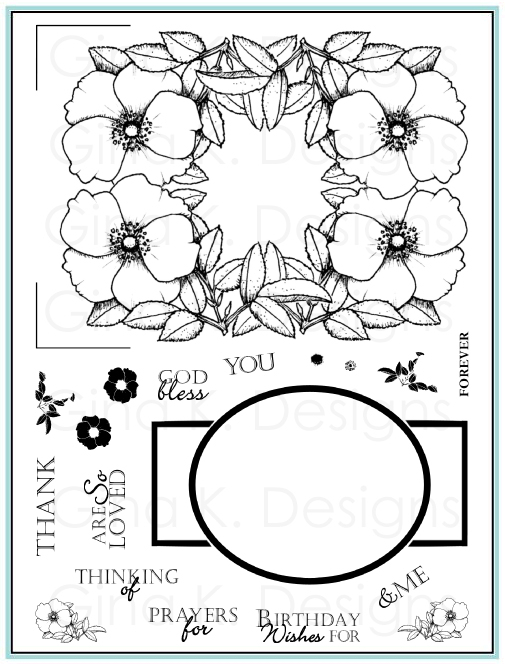 Add Stickles, brads or other embellishments to the star centers to dress up the pedestal. 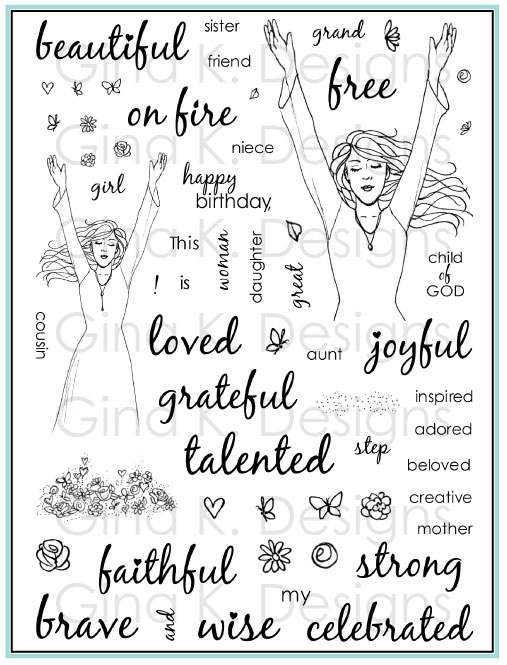 The font matches all Melanie's animal sets, mix and match to extend your greetings even more. The long greetings are all meant to be used after both "time to" and "hope you". 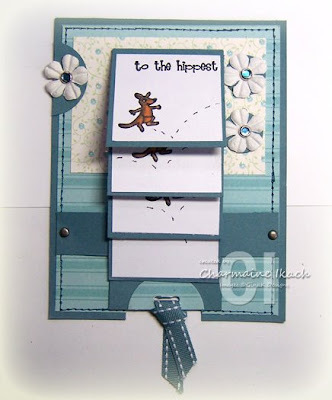 "Time to" "announces" it, and "hope you" can be great for the inside of the card! 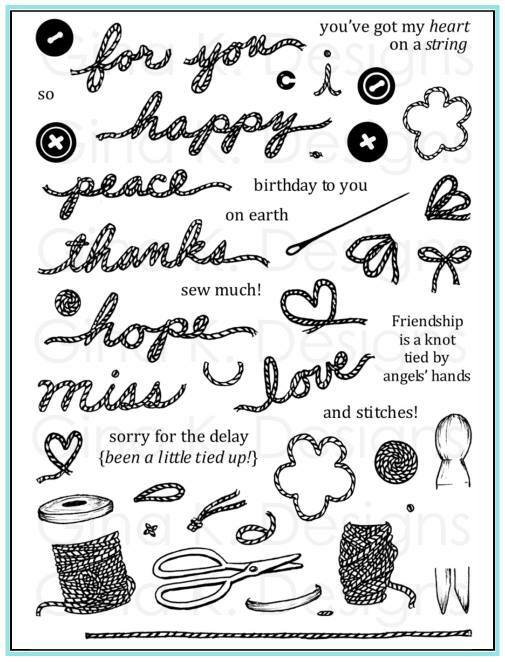 The party greetings and "date", "time", "place" etc can be used to make invites with any of your other your other stamps. The bear can be colored black brown etc to look like any kind of bear! The seal can be made to hop back and forth on his pedestal when doing the Charmaine "tilt card". Have any animal try balancing on the ball and then make it tilt back and forth. "Time to make a big splash" - perfect for pool parties! Cannonballing polar bear or swan diving seal! 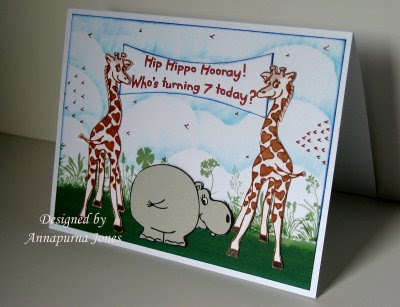 The images and sayings make a terrific set for scrapping kids pages, parties, trips to the zoo or circus. 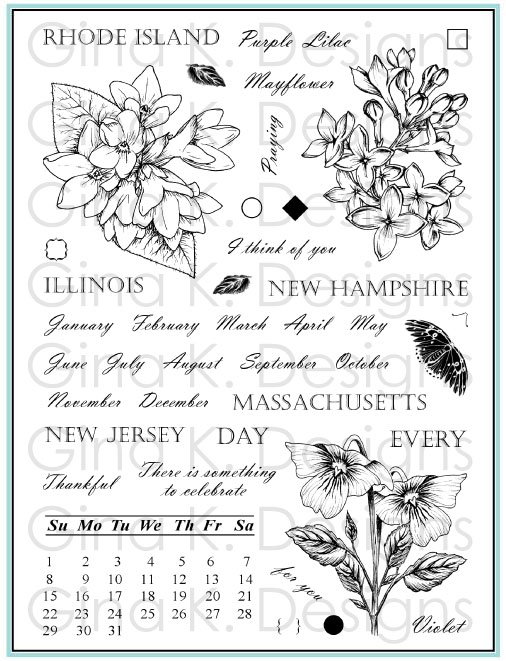 "Date", "time", "place" etc stamps are great for journaling in your scrapbooks or sending out announcements. 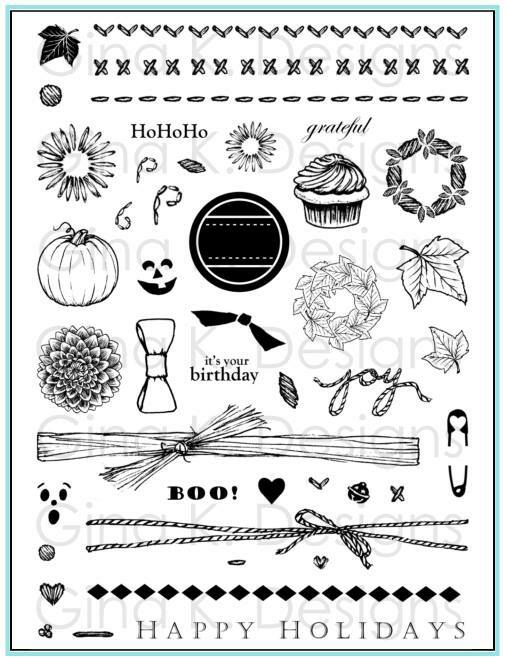 Put the individual date, time, etc inside the balloon image and fill in the info, either in a balloon bouquet or in a vertical line on the left on your paper and write out the info to the right like you see on most invitations. They also looks terrific stamped in one section of the ball, and the info filled in on another section! 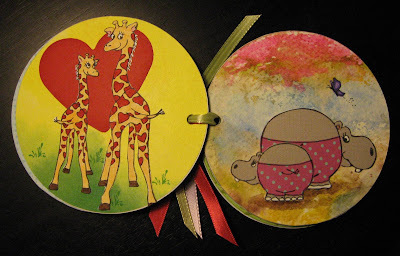 Stamp the date time place etc on each of the little signs like flags or having them hanging like the signage on my giraffe card. 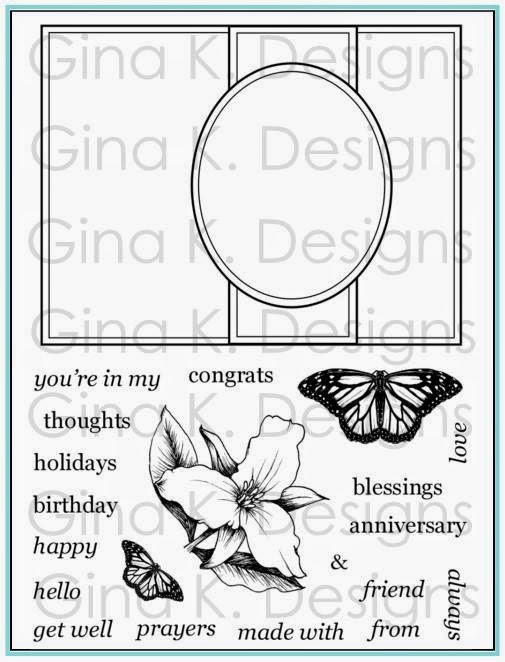 The Gina K Designs Team all received their stamps about the same time last week and our new resident rock star Linsey emailed saying she wanted to figure out some way to put the zebra on a pole like a carousel, funny, I was thinking the same thing! (but really wasn't sure how I'd do it exactly! So we both had a challenge! 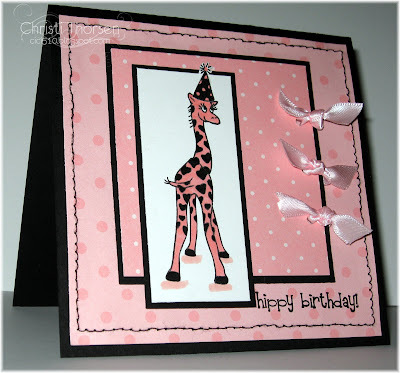 (Coincidentally I'd also planned making a pink zebra card by the 20th, and then lo and behold, Gina K posted one similar to what I was going to make on her blog! So I had to change what I would create around to give you some new ideas, and incorporate some kind of ding dang pole!) I decided my best option on hand was ribbon(and although I'm not wild about the plain white ribbon, but it was the only one that worked with the colors I picked. I made a slit above and below the body and pulled it through then wrapped it around the card and tied, so you can pull it. Linsey's peek at the party (click on the paperclip you see on the release party thread to view it and all the other great peeks) was TOO cute, I don't where she found/made that real pole!! You could used color straws or strips of paper too. Now I want to see who YOU'd do it! Anyone with some time on their hands want to construct some huge freakin' chipboard, blinged-out carousel?! Wouldn't that be cool?! Later this week, a tip sheet and blog candy!!! Red, White and Sky, Easy as Pie! I think this is my favorite card I 've made so far for this release: Aren't these colors just so fresh and sparkling?! You know I love red, but all the white added it to gives it such a nautical look! I wanted to make the bear floating in the water, and I realized I could take my design a step further to show where he just came from using my new beach scene from the new "Free with Three" set "You are my Sunshine"(don't you love these greetings?!)! Hopefully you can see his big ol' footprints I colored leading to the water's edge! :) The shadow under the umbrella gave the scene so much more dimension than before I added it(took my lighter brown copic I used for the sand and picked up color from the tip of my darker brown Copic to produce this deeper shade) Everything got so much brighter when I dared to go a little darker in that area! Now here's how to make the innertube! Punch your oval first in your cardstock, an then punch the key tag around it, with the oval closer to the top (holding it upside down to see where you're punching) That's it! Now cut out your bear, and plunk his big bottom in the punched oval! I cut a wavy slit about 1/2" down from the top of the water with my hobby blade and inserted the inner tube just below the surface so it looks like he's bobbing along(refer back to card). Now, here's a fabulous red and white pie, perfect for your Memorial Day weekend! It's so cool and refreshing to eat, and the red berries look dazzling on the table(and the hint of almond flavoring in the cream cheese is heavenly)! Then fill with the whipped cream cheese mixture. Last add your berry mixture(see top pic), and chill! Let me know how you and your guests like it! By the way, rent "Waitress" and watch while you eat! "baby, dontcha cry, gonna make a pie, ..." I love that movie! Cook and stir the first three ingredients until thick. Add 1/2 of the package of jello, and stir until dissolved. Add a few drops of red food coloring if desired to make it extra red! Cool. Add 1 quart of strawberries(rinsed and chopped) to the glaze and mix. That was SOME party last night!! Oh my goodness, I'll be back to share more details about that later! Was everybody able to tell from that freakishly long last post (just wanted to give everybody props!) that both Bee and Donna won the contest?! * hip hip hurray for Bee and Donna! (I still don't think Bee knows she won, she arrived fashionably late to the party after the announcement was made and I don't think she could find it amid the 200o replies to the thread! )Leave them some love here or run over the their blogs and say congrats when you get a chance! Mask your zebra and stamp the ball so it looks like he is tip-toe atop it! Cut, and on the back of the ball apply a dimensional, a penny, and another dimensional. Punch a half inch circle near the bottom of your mat(I just slid my SU 1/2" circle up til it stopped and then punched) put your last dimensional through the hole, peel off the backing and add a penny on the other side. You're ready to rock!! (I have another greeting in this set which goes with this image: "kick up your heels!" 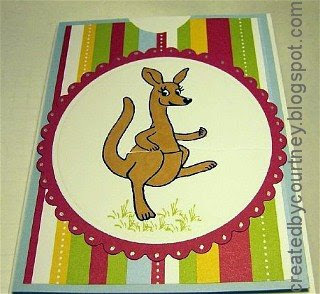 Think what a fun ladies night card that could be with different colors!!) Mount your mat on dimensionals as well to give the penny room to move. I held off on any Cuttlebugging and patterned DP on this card and just let the bold impact of the stripes and bright colors be the focus. Ball was colored with Copics, the zebra, no coloring needed, just stamp and go, I LOVE these bold stripes!! Could you die for these brads??? If you have any of my other sets(or have them on your wishlist) you'll find the package in addition to this zebra print also contains patterned brads that would be a GREAT match for my frog, my giraffe, as well as maybe a few CLUES as to what's to come!! ;) The patterns and jumbo size adds so much "rowwwrr!" to your project, can you tell I'm wild about them LOL! The Cs is SU! Cool Carribbean and DCVW Textured Earth Elements. I used the classic and scalloped Nestaibilites for the focal point and the SU! ticket punch at the corners. *Laurie's Coaster book and Courtney's Pull card were right behind, with everyone else close behind that! EVERYONE was somebody's favorite, I hope you're as proud of your marvelous work as I am, thanks again for creating such inspiring projects! Hip Hop Entries...the Voters have Spoken! 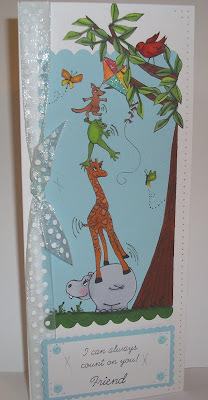 Have any of you ever tried to make these waterfall cards?? I think they are such a pain in the hippy to make(I've only made ONE before), but so worth the time and effort if it comes out as cute as this one (just not my time and effort LOL!)! I wouldn't be able to resist pulling this again and again, flip, fliiip, fliiiip! So smart to have the greeting just keep going with each hop, that Charmaine, she's just so clever! This just gave me the warmest, fuzziest feeling like I got for Linsey's lamp in my first contest, just such a sweetness about it! I'd seen people alter cube blocks before, but I really liked these colored blocks and the different shapes, so cute for a tall giraffe or a long patch of grass! And I thought it was so smart to decoupage the paper piecing on instead of coloring, she really thought about toys kids like, with a plain image on one side and then a colored or patterned on the back, surprise! I love that! 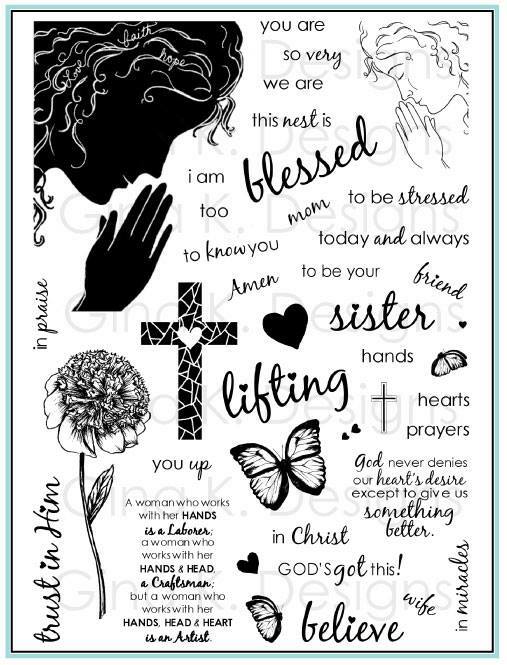 Everything about Christi's card just works: excellent lay outs, details, colors, so clean and classy! I'd be just as comfortable sending this to a 5 yare old, 25 year old, 45 year old girl, it's just awesome! Bee's card was the first entry I received for the contest! (She sent another REALLY cute one, but this was my favorite, and apparently yours, too!) The giraffe peeking out of the buggy(where'd that come from?) was just the cutest thing, and so many other elements she chosemade it so baby shabby chic. The DP, colors and fancy punched edge were great, but I think what really gets me is the white swiss dotted "fabric" behind them, I can just smell and feel a soft, sweet baby in my arms when I look at it! Annapurna's stretched banner was fabulous! 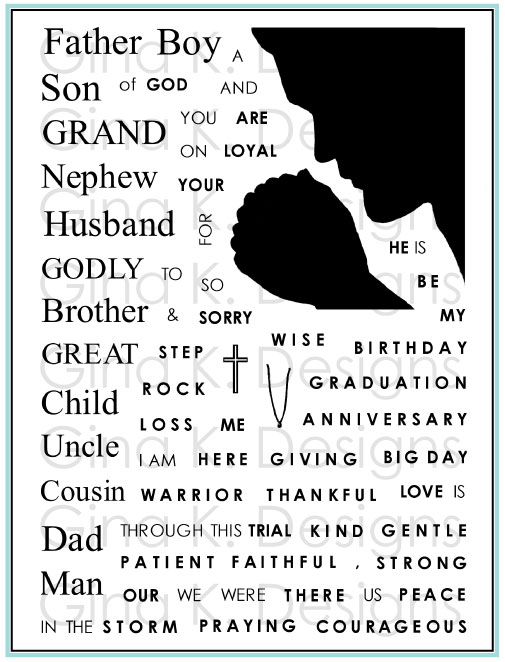 I love making huge banners with block letters to hang up or spread on the table for the person we are celebrating, it's just so festive, so I loved this "card version" of that! (She printed her lettering on the computer) I also love the background she made, the little "v" of birds, the tall grass, just looks like a complete "storybook page"! 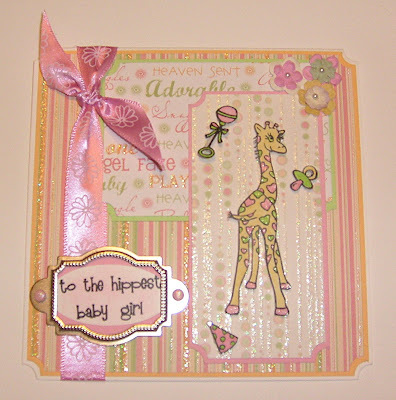 Lee's glitterfied baby card is so "Lee", love all the girly bling, sweet pastels, layout and how she cut out all the little matching accessories and put them around the giraffe. I think we need to all apply firm pressure to Courtney to make a tutorial so we can all duplicate this pull card! Even though I *know* how she did it, she pulled it off so brilliantly I can't help looking at it thinking, how'd she do that?? (like watching some accomplished magician!) It just lines up so perfectly and is the most fun surprise with the balloon greeting, go Courtney! Now pretty please, a tutorial?? back me up, girls! This made me so smile so big! The little line of roos getting out of school and the teacher's smock she made were just so perfect! Carol, are you a teacher by any chance? 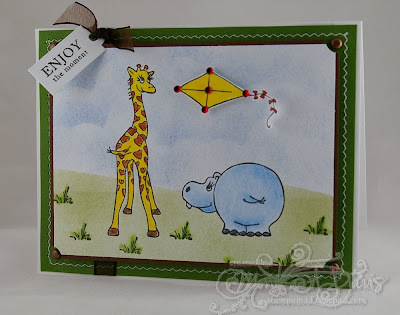 Cathy's "kite rescue" was just the most creative, delightful idea! 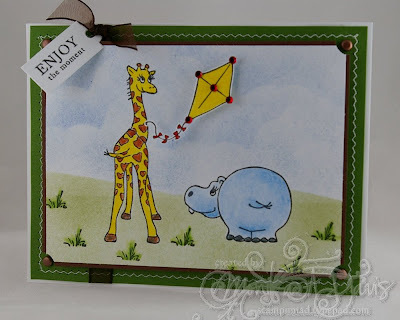 I'd been thinking for awhile it would be fun to have the baby giraffe looking up at his stuck kite and have the larger one come save the day, but I had NOT thought about everyone pitching in to get it down (who needs tall grown-ups when you've got freind, right??) SO much better than what I'd have done! "I would like to vote for Laurie's Coaster Book. All the projects are amazing. Sue"
Please send me your addy, Sue! I hope you will all (and I mean ALL, not just the ladies above!) try out for my Guest Designer spot this month, hopefully you can see everyone above had very different styles and types of projects and I thought they were ALL great! YOU CAN DO IT! Sneak Peek #3: Get Ready for the Party! Sneak Peek #2: Are you Ready to Flip?! Sneak Peek #1: Just My Type! Virtual Florist: Happy Mother's Day!! EASY Jewelry from Jackie G! Ack! Even More Piercing Potential!